Every year since I was four the Christmas Elf has come to visit on December 1st, (well not every year – there was that 14-year stretch when there weren’t any kids around.) But for the past three Christmases, the Christmas Elf has come to visit on December 1st. During my childhood he would usually leave a cheap chocolate advent calendar (whose distinct chocolate – I admit – holds a nostalgic spell over me.) But as Joel and I got older, the stakes were raised and we began receiving a Christmas countdown calendar full of special messages. 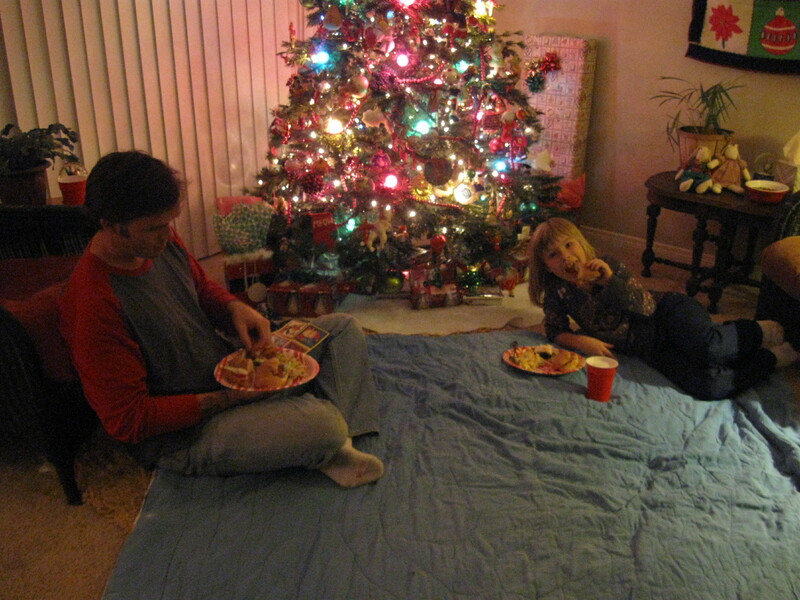 We’ve continued this tradition with Madison and last night was one of my favorite activities – the Christmas Picnic. This year I made melted black forest ham sandwiches with havarti, apples and roasted red peppers, coleslaw, home made potato chips (really easy – and yummy!) 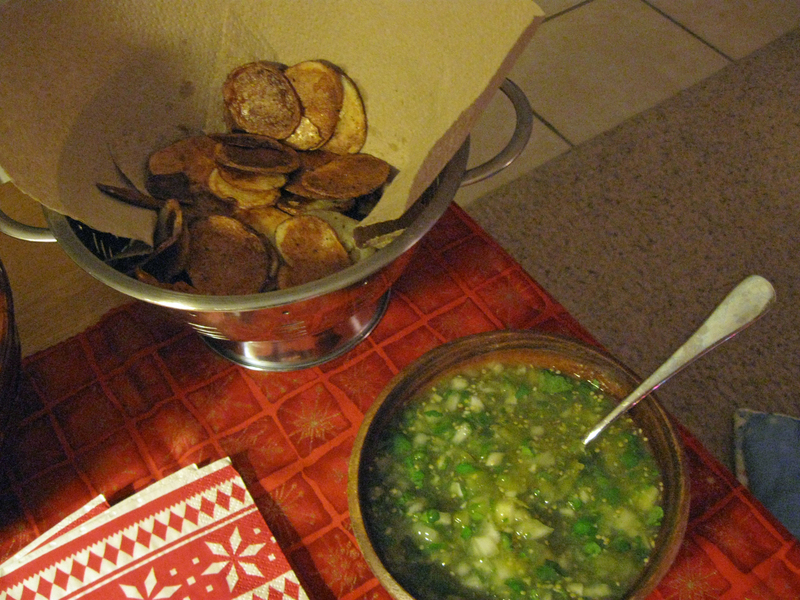 tomatillo salsa and peppermint Christmas brownies. There weren’t any leftovers. 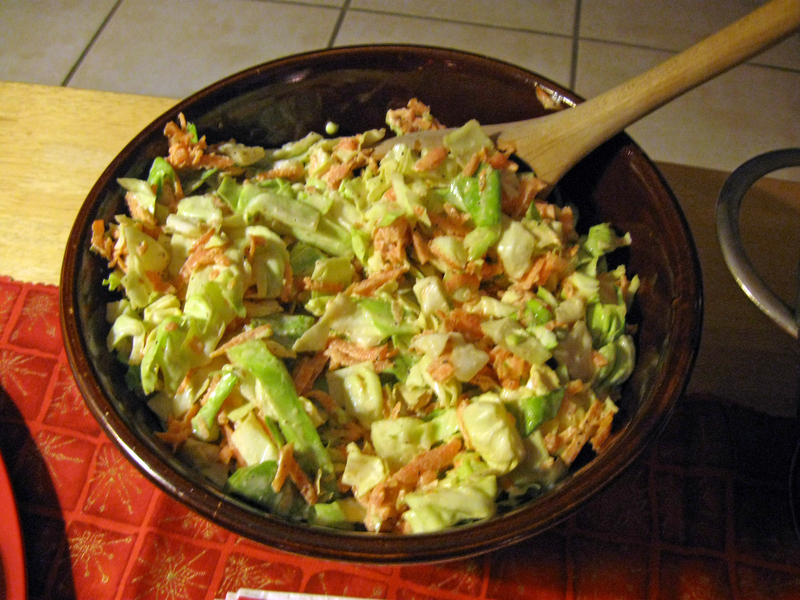 Combine cabbage, carrots and mayonnaise in a large bowl and mix well. Salt and pepper liberally before serving. Avoid stirring or turning the potatoes as they bake on each side. Moving them around will cause them to stick, tearing the crispy surface from the chip. Heat oven to 425˚. Place two baking sheets in the oven and let heat for about 10 minutes. Slice the potatoes into ¼ inch thick rounds. Toss the potatoes with olive oil, salt and pepper. Remove the baking sheets from the oven and arrange potato slices on sheets in a single layer. Bake until the potatoes are golden on the bottom side, about 30 minutes. Turn potatoes over and bake until they are golden brown all over – about 15 minutes more. Remove from oven, drizzle with vinegar and serve immediately. I totally cheat on this one and use boxed brownie mix. HOWEVER, only the best boxed brownie will do. I prefer the Ghirardelli dark chocolate brownie mix. In a large bowl, beat together the butter and cream cheese with an electric mixer. With the mixer on low speed, add the powdered sugar a cup at a time until smooth and creamy. Beat in the peppermint extract. 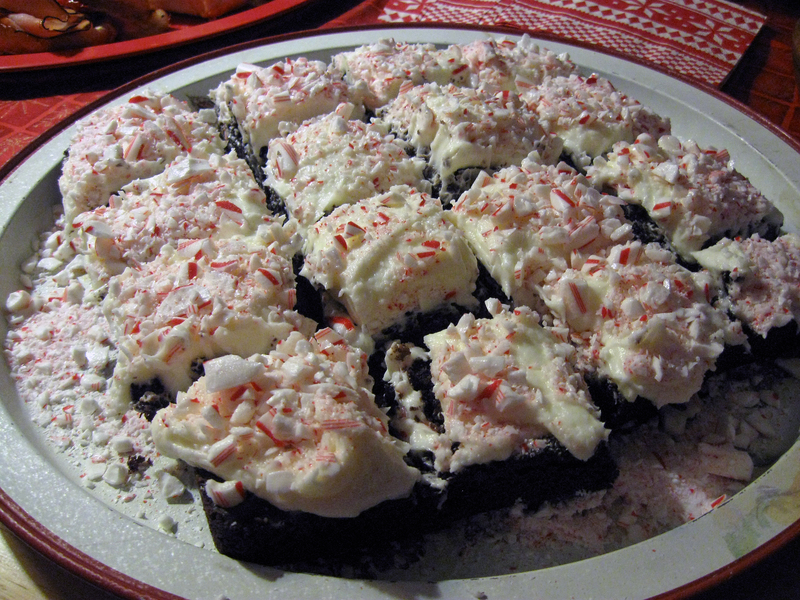 Frost the brownies and top with crushed candy canes. I love the Christmas elf.. I would like to add the reason the Elf comes is to pick up the kids Christmas list. This way they can’t change their mind because Santa already has the list. Believe me, Heather and Joel could change their mind every day.